Buying a house usually means buying a few trees as well. Every house I’ve owned (now on #4) has needed a good deal of upkeep regarding the trees on the property. Sometimes they are dead, sometimes they have limbs running into the house and sometimes the roots are messing with the foundation. I’d say it’s more common than not that this is something you’ll engage in as a homeowner at some point or another. I absolutely love trees. As far as I’m concerned the more the better. It makes me sad to see any tree get cut down, but sometimes you just can’t avoid it. 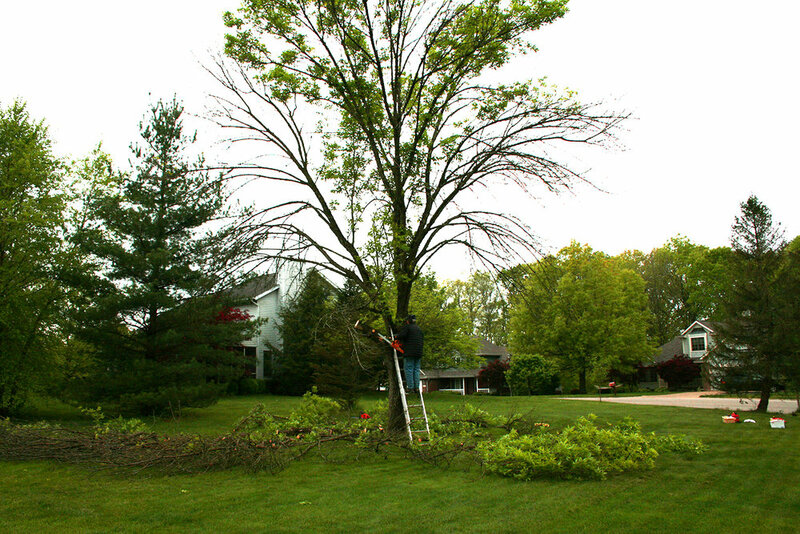 In this case, we were dealing with an ash tree on it’s way out. 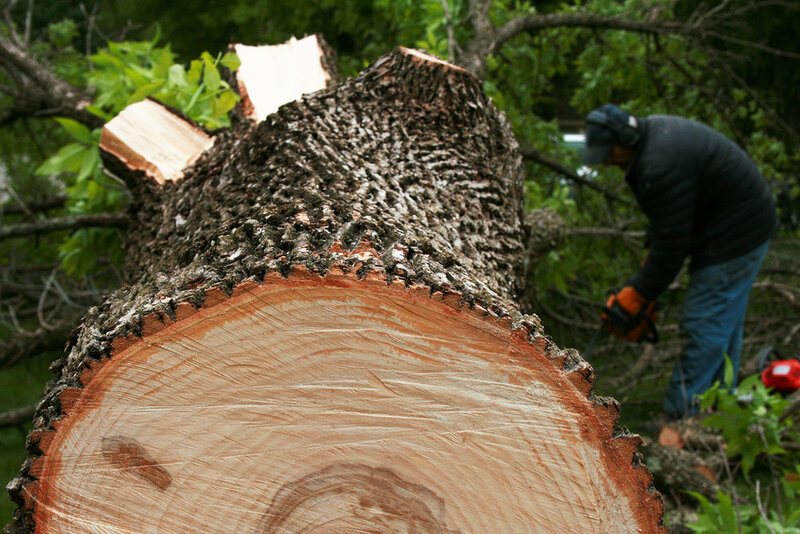 If you haven’t already heard, the ash trees in our area and much of the Northeastern United States are being attacked by the Emerald Ash Borer (EAB). 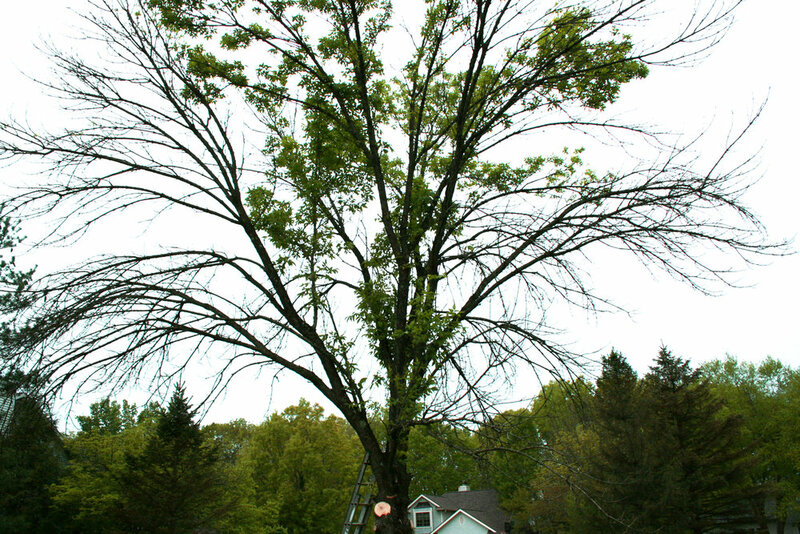 This is an invasive species that eats away at the inner bark of ash trees while in its larval form. You can see – this tree is not looking happy. I always recommend that if you think you have a dying or diseased tree please have a specialist look at it. 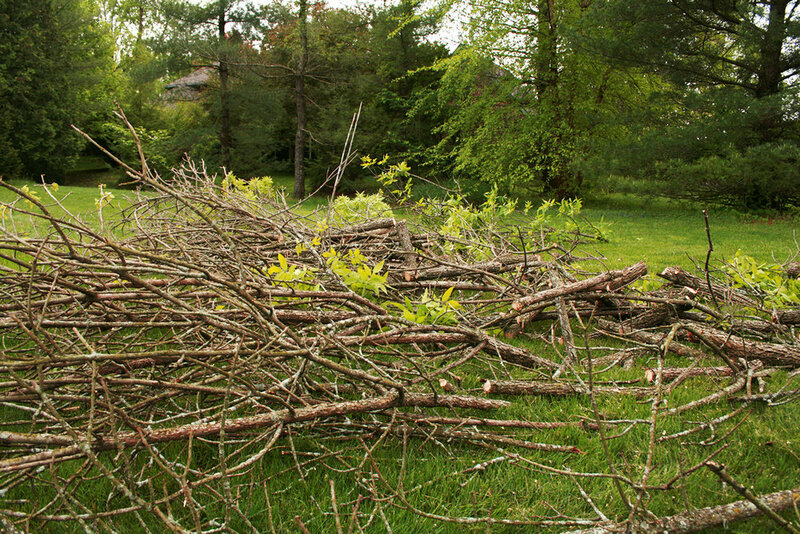 Many trees can be saved and, when possible, I always opt for keeping a tree around. Unfortunately, this one was doomed. That darned exotic beetle had done it in. 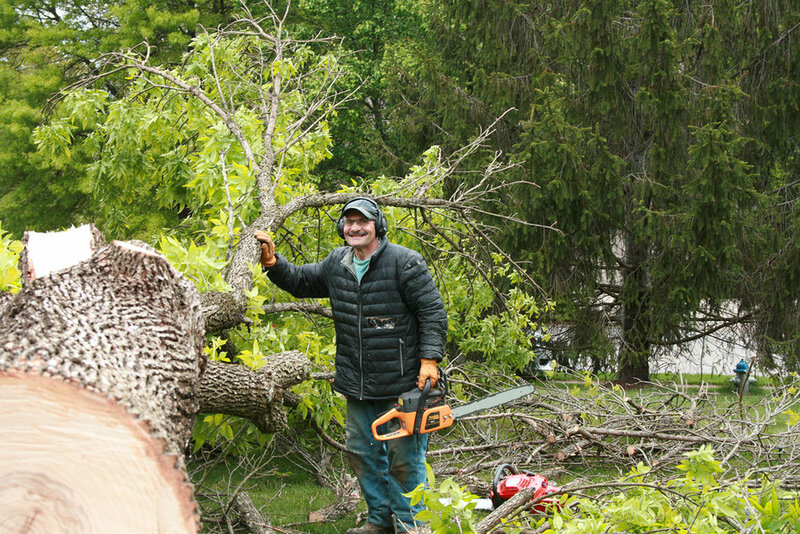 My pops has a TON of experience with trees so I asked him for some help on this project. I would also recommend NOT trying this on your own. Unless you have a small bush or seedling, it’s always best to have a professional manage a project like this. You can tell the EAB has done its dirty work by some tell tale signs. Usually with this, as with other diseases, you will see the crown of the tree dying back. 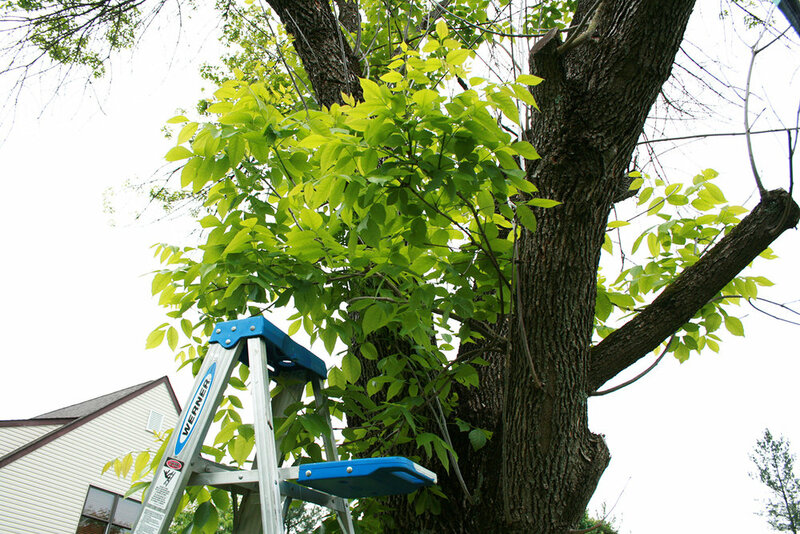 Usually the large limbs at the top will die off leaving large areas with no new growth. As a last-ditch effort the tree puts all its remaining energy in new growth, usually around the base of the tree or in the lower regions. You can see that below. If you do have to cut down a tree, re-use and re-cycle it. I cut the trunk up and will later split it so I can use it as firewood. (NEVER transport firewood though… that’s one way this stupid beetle keeps traveling around the country). I also cut up all the limbs and made several trips to Good Earth. Good Earth is an excellent company here in Bloomington that takes yard waste and converts it to rich compost. 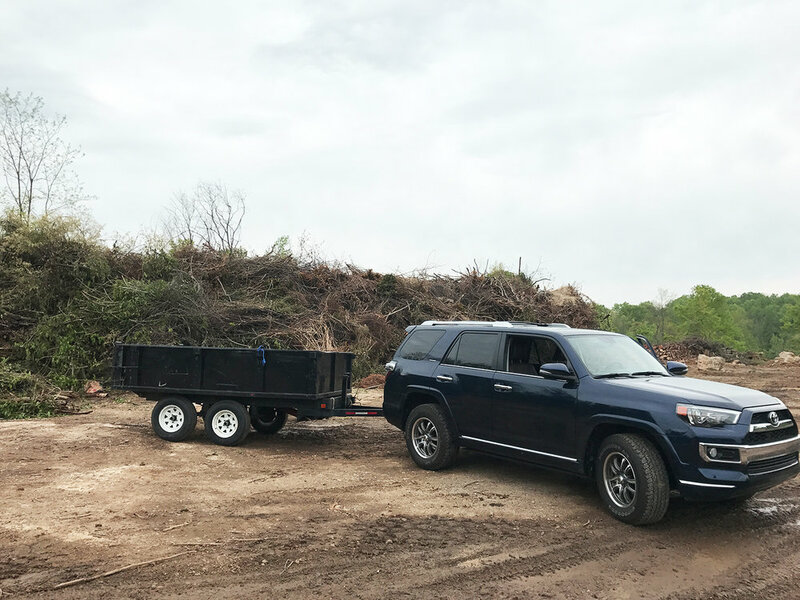 Here’s a pic of my 4Runner “The Blue Goose” taking a load to the yard waste area (thank you Michael Korus for the use of your fab dump trailer). It took 4 trips to Good Earth and about 6 hours of hard labor, but the work is done, and I got to spend a day outside and even better, with the great company of my dad.